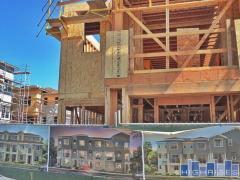 The Carrara is a mid-rise condo community in San Jose that was built by KB Home in 2006. The building features all the amenities you would expect in a newer condo building, such as a pool and spa, workout facility and club room. The amenities in the condos varies depending on how the original owner configured them, but some have granite slab counters and other similar luxury appointments. Have any comments or questions about Carrara Condos? Ask your question and/or share your thoughts about this Building. Carrara Condos at Grassina Street has excellent facilities, and offers a peaceful environment. Hello Surinder - Many of the units at Carrara offer hilltop views that are unmatched in any Silicon Valley condo complex. Most all the views are of the South Valley of San Jose because they sit on top of communication hill.